Home » Chicken Recipes » KFC Honey BBQ Strips – make these at home with our copycat version of this recipe. You can go out for these chicken strips, or you can make our version of these at home. These are easy to make with a little elbow grease. You can make these up fresh for a ball game, tailgate party, or even a family night in. Rather than buying a big batch of these, you can make a large batch of these at home. 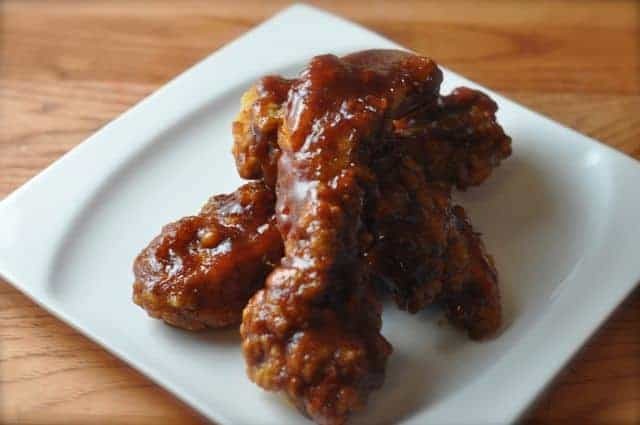 In this recipe we have you making battered chicken strips, and then we add a few extra ingredients to BBQ sauce that you can find in the grocery store. We think that you will find that these taste very close to the original. Make these KFC Honey BBQ Strips at home with our copycat version of this recipe. Mix flour, salt and pepper in bowl and set aside. Place buttermilk in separate bowl. Heat oil for frying and dip chicken strips in flour then in buttermilk and then finally flour again. Place in hot oil, the temperature of the oil should be 375. Never over crowd chicken strips, fry until lightly golden brown. Remove strips and drain.Place all above ingredients in a small sauce pan mix thoroughly and simmer on low heat stirring frequently for 20 minutes. After cooking for 20 minutes. Let sauce cool slightly, dip one chicken breast strip in sauce at a time and place in a baking pan that has been sprayed lightly with a none stick spray. Place in a preheated oven at 350 and bake for 20 minutes. Serve with your favorite side dishes or pack up a few things and have a picnic in the back yard. Can I just buy chicken strips or do I buy boneless chicken breast and cut them into strips ? You can do either but buying the breast’s skinless and boneless will give you more chicken. They charge extra per pound to cut it for you. These are wonderful. So easy and quite tasty. They are sticky when comming out of oven but have great flavor.